"Local family business with a nice selection of frames & excellent customer service. And, they carry Silhouette frames, which I personally really like (plastic frames look terrible on me). I came on a Saturday morning & there was a bit of a wait as everyone was helping other customers, but I'm guessing it would be less crowded during the day on a weekday, if that's important to you. Highly recommend, if you are looking for a nice pair of professionally- fitted eyewear." "We just moved to town. My glasses broke. We walked in on Saturday morning, and they replaced a broken string, tightened my wife's glasses, and wished us a happy weekend. "How much do we owe you?" "Not a thing." Old style service.. Very much appreciated." "Searched yelp for recommendations on good opticians and I found this one on the top! I had no time to review all the recommendations so I decided to visit this shop. The shop gives a good vibe with nice arrangement of various brands of glasses. I see a statement written on wall "serving from 1958" and thought it must to be good place to be in. My opinion still got stronger when Mr. Bundy greeted me with warm smile. I went there to fix the frame of my glasses and he assured me it is a very small one to fix. And guess what... he did not charge me anything and the glasses were back to their original form without a clue that they were once broken. I would definitely suggest this optician to everybody who is looking for good service. Thanks Mr. Bundy." March 26, 2014 Kara S.
"Great fast service for a new pair of sunglasses! Very professional. Would definitely go back and recommend!" "I've just bought my fourth pair of glasses from Bundy's over the last few years. Jerry and Jose are perfectionists who do a phenomenal job getting you the perfect glasses for amazing vision. 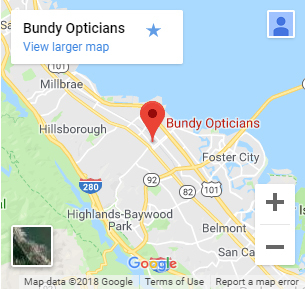 Prior to going to Bundy's, I had a lot of trouble with eyeglass stores giving me poor-quality lenses where I didn't see well and had to get the lenses remade multiple times. All four of the glasses I've bought from Bundy's have given me perfect vision. Jerry gets everything right with my lenses--coatings, edge polishing, lens material and thickness, and arranging my glasses to be at the right height on my face. Jose is a master eyeglass fitter; he can fix my crooked frames so much more quickly than most fitters, and I'm a person who can't tolerate having my frames being crooked by a millimeter. This is THE place to buy your glasses!"